Will return to the review of Hong Kong restaurants tomorrow. In the meantime, I went to check up on the Red Shirt protesters Sunday afternoon. Here are some video and photographs. The link to my first visit to the protest area on April 9 is here. 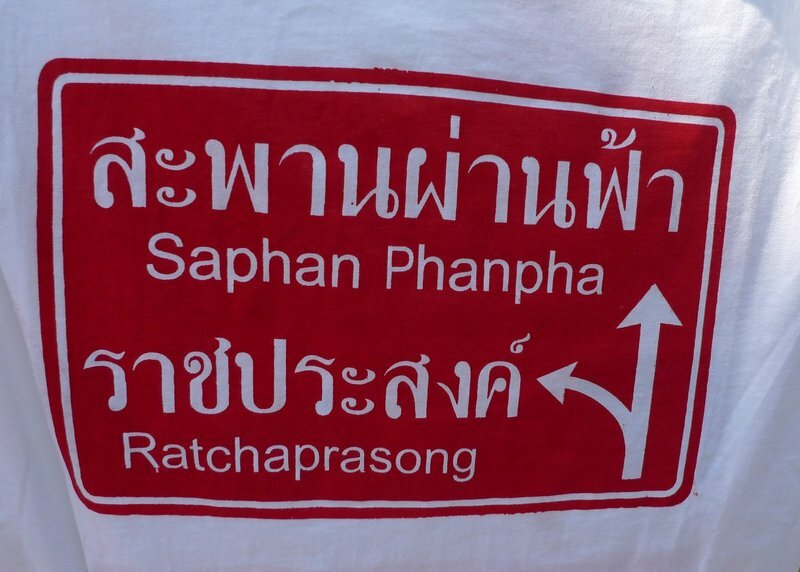 T-shirt being sold by one vendor, commemorating the move from Saphan Phanpha to Ratchaprasong. 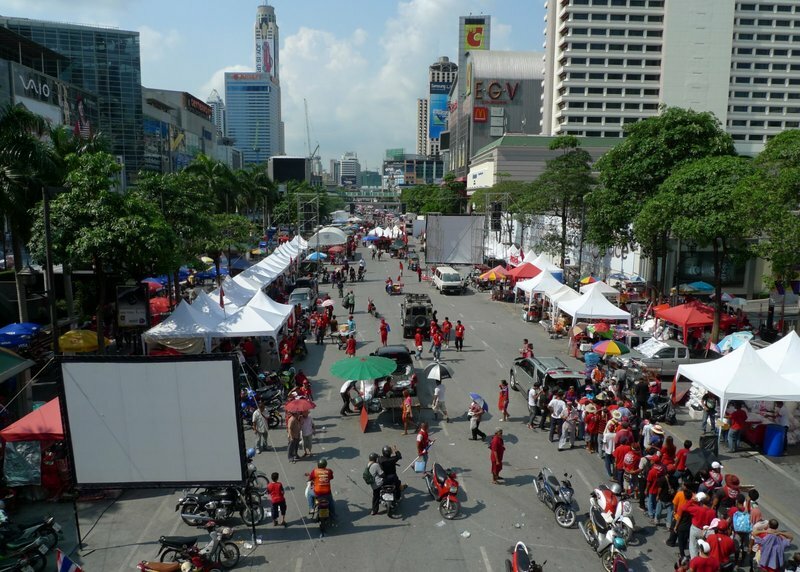 Last week a few days after the army clashed with protesters at the Panfa Bridge (“Saphan Phanpha”) in the old city, resulting in two dozen deaths and more than 800 injuries, the Red Shirts left that encampment, moving instead to the Ratchaprasong intersection at the heart of Bangkok’s high-end shopping district. There are probably 4-5,000 protesters at the intersection, although they are spread out in the midst of the day seeking shade. This view is looking south along Ratchadamri road. The Grand Hyatt Erawan is the first all building on the left behind the Skytrain tracks. Gaysorn Plaza shopping center is the building immediately on the left of the picture. Turning around and looking north towards Phetchaburi Road, you can see Central World Plaza and Isetan department store on the left, and Big C on the right. In the old city, protesters defaced much of the encampment they evacuated, including the Democracy Monument. 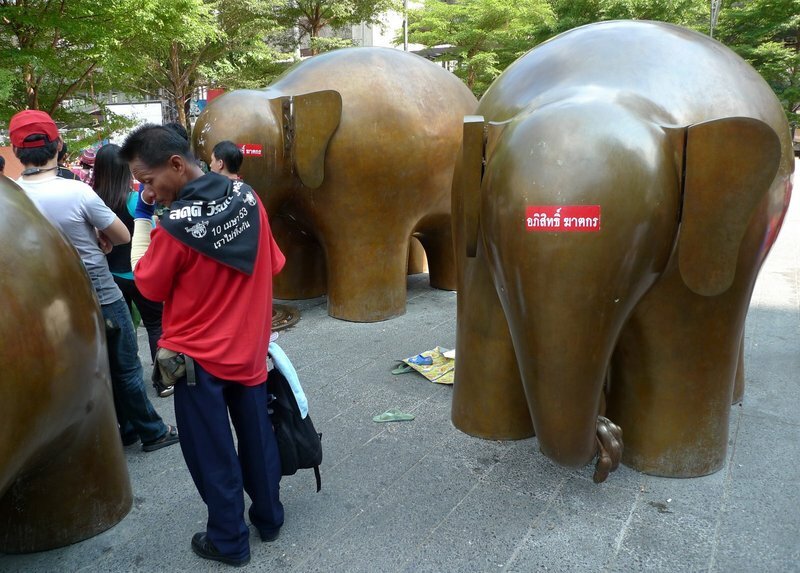 It seems that their respect for property (or lack thereof) continues at Central World Plaza. 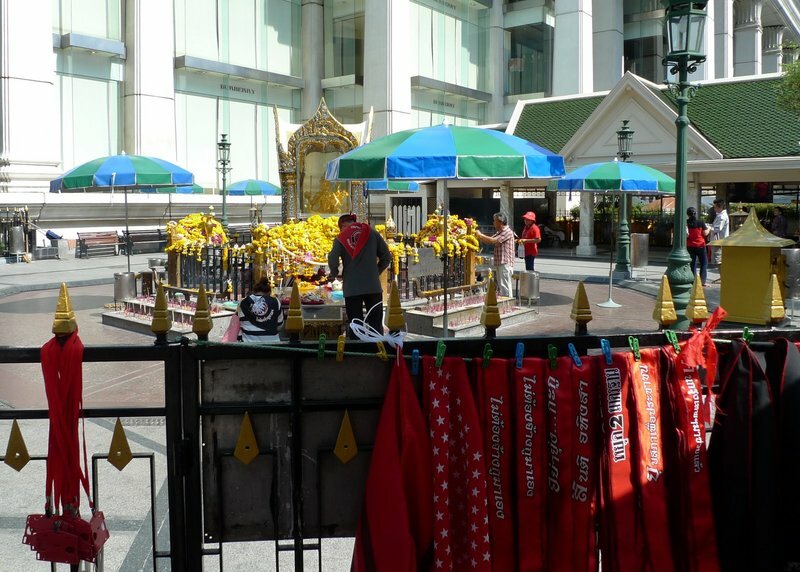 The famous Erawan Shrine, a popular destination for tourists from elsewhere in Asia, is closed. A few Red Shirt protesters used a small side entrance to light incense and candles, paying their respects to the Hindu god depicted in the shrine. One thing I noticed was a large number of monks who have joined the protesters. 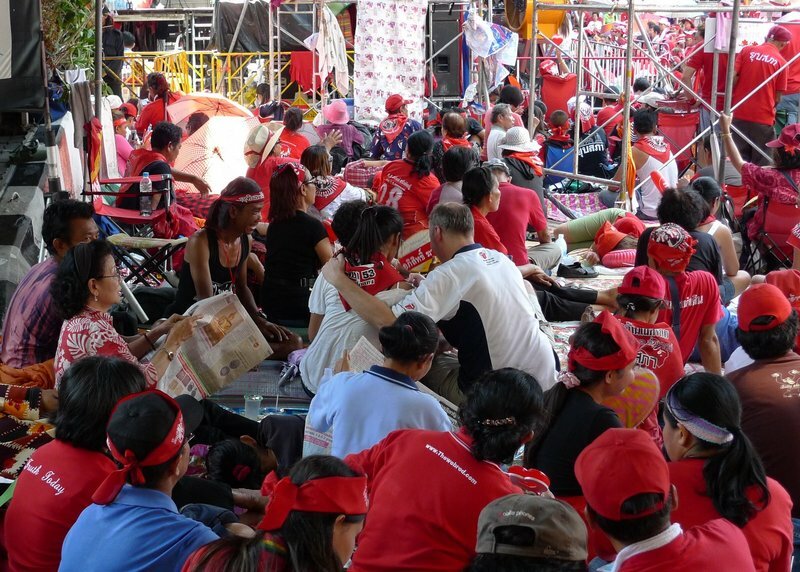 Unlike the situation in Burma, where the government is clearly repressing the people and I can understand why the Buddhist clergy is at the forefront of the protests, the Red Shirt position doesn’t seem to lend itself to religion. Of course, neither does the position of the Yellow Shirts, who are threatening to counter protest this week. There were a few other farangs wandering around. Most were taking pictures while this couple just seemed to not have received the news about the area being shut down. Note to visitors to Thailand: when I talk about Thailand being a conservative country, I’m talking about the inappropriateness of this lady’s manner of dress: cover your shoulders and a bit more of your legs, please. 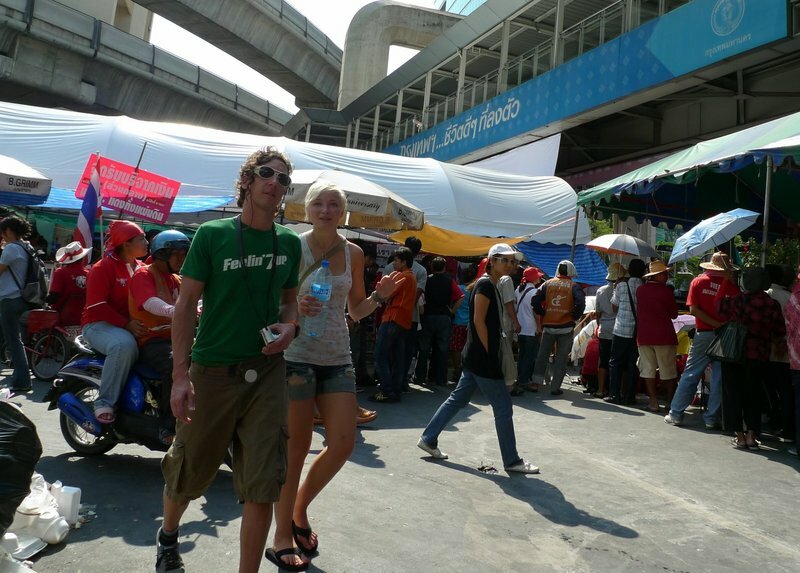 This farang seems to really be getting into the act, joining his wife (girlfriend?) in the crowd. I guess it is nice to support your spouse’s politics, but I’d remind him that the Immigration Department might not look too kindly on foreigners engaging in political protest. This was about the only thing for sale in the protest area that wasn’t red. It was a family affair with children dressed up and indoctrinated into the fun. Perhaps they are planning on being away from home for several weeks more so brought the whole family. The heat was immense, especially in the direct sun, and I was impressed at the organization of the crowd. There were security patrols, meals being dispensed, and first aid facilities. With so much infrastructure, you have to wonder who is bankrolling the protests. 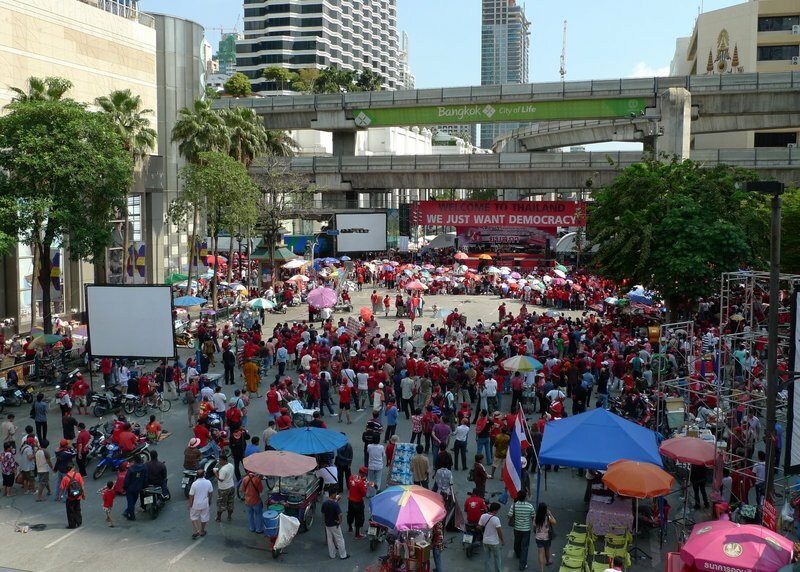 This entry was posted in Uncategorized and tagged Bangkok, Krungthep, politics, Protests, Ratchaprasong, Red Shirts, Thailand, UDD by christao408. Bookmark the permalink. Now you’ve made me wonder too. It is one thing to have protests and quite another to have outside interests fomenting political unrest! I was surprised to see the monks involved. Hope the protests remain peaceful. All seemed to be one big picnic trip to the big city for the country folks. 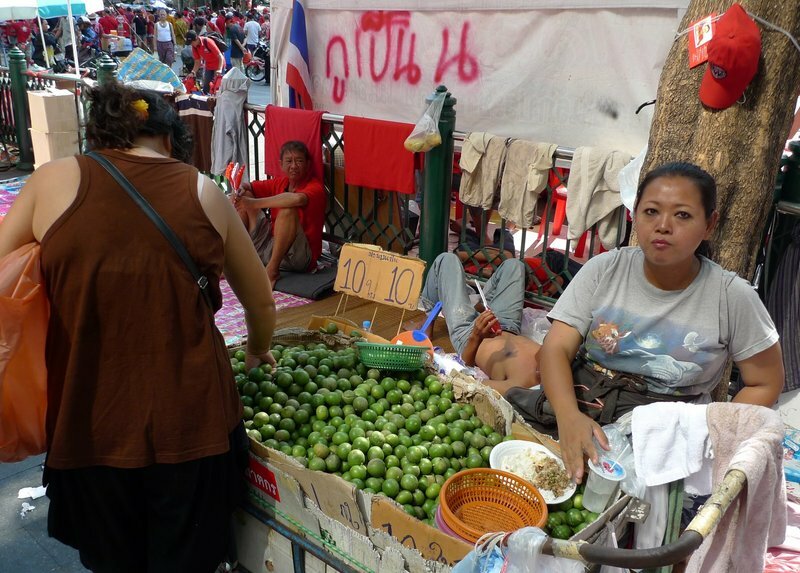 I guess you may find more revealing fashion styles at Kao San Road? Thanks for the update, Chris — Are you still safe? Yeah who IS bankrolling it?! 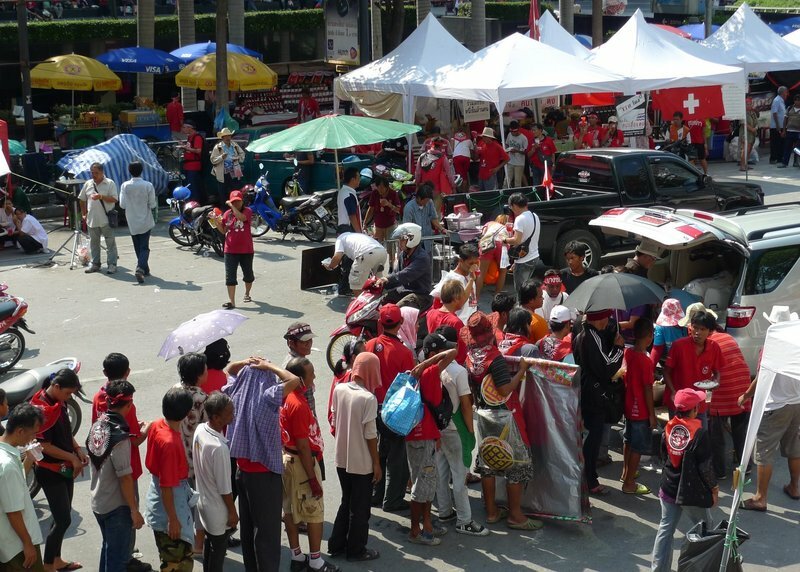 @yang1815 – Word is, Thaksin (ex-PM and fugitive) and his cronies are paying the protesters. Not that their grievances aren’t real but there’s no way poor farmers can be away from home for two months with no income. @slmret – Still safe but giving that area of town wide berth. @CurryPuffy – It does kind of look like a picnic trip, doesn’t it? @TheCheshireGrins – Good question. I don’t believe it has a particular significance although might be meant to symbolize blood – willingness to give your blood for the cause, etc. There are those on the other side (Yellow Shirts) who are trying to drum up images of the US-backed anti-communist effort/repression from the 60s and 70s, castigating the Red Shirts with some of the same names and accusations used in those times. @stevew918 – Headline from today’s Bangkok Post: “Soldiers Issued Live Ammo”. @murisopsis – Who is manipulating the masses? That’s the question. 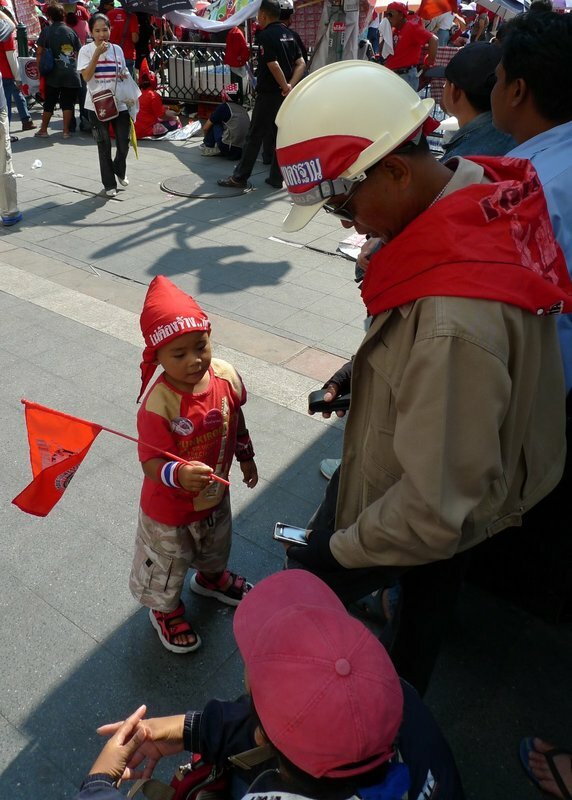 Hi Chris, about the color scheme – the red represents “NO” as in “No to the 2007 constitution” which was drafted after the 2006 coup that ousted Thaksin. It was the color used by those campaigning against that constitution in the referendum, as opposed to those campaigning for it, who used the color green. Yeah, I read on the news that the Thai army is patrolling with live ammo. I think the Army is on the Yellow Shirt side. That is definitely not a good sign. Stay safe, Chris and Tawn. @Poomsira – Ah… I didn’t know that. But the color itself doesn’t have any particular significance, does it, in the same way that yellow stands roughly for HMTK? @stevew918 – The Army has many factions in it and is kind of a third entity. I wouldn’t describe them strictly as being on the Yellow Shirt side, otherwise there would have been a crackdown on the Red Shirts a long time ago. No, not that I’m aware off. By the way are you back in Thailand? I’m doing the bike ride next Sunday starting from the King Rama V Equestrian Statue Plaza thing, interested? @lcfu – Well, I’ve been told by many Thais that that isn’t an appropriate form of address for an adult. Don’t know if they are right or wrong; that’s just what I’ve been told. Just be safe Chris. I cannot imagine the monks would be involved. How sad that the protestors would deface various landmarks in the city… Political unrest always is such a costly affair to the entire nation. I read that many of the poorer conscripts in the army sympathize with the protesters. There are so many different perspectives in our news here. It’s hard to put together an accurate picture. @Poomsira – Would love to, unfortunately have a condo homeowner’s association meeting (the annual one) on Sunday at 10 am. Tawn’s going to apply to be a association board member so I need to go and cheer him on. Let me know when the next ride is; I need to get back on the bike. 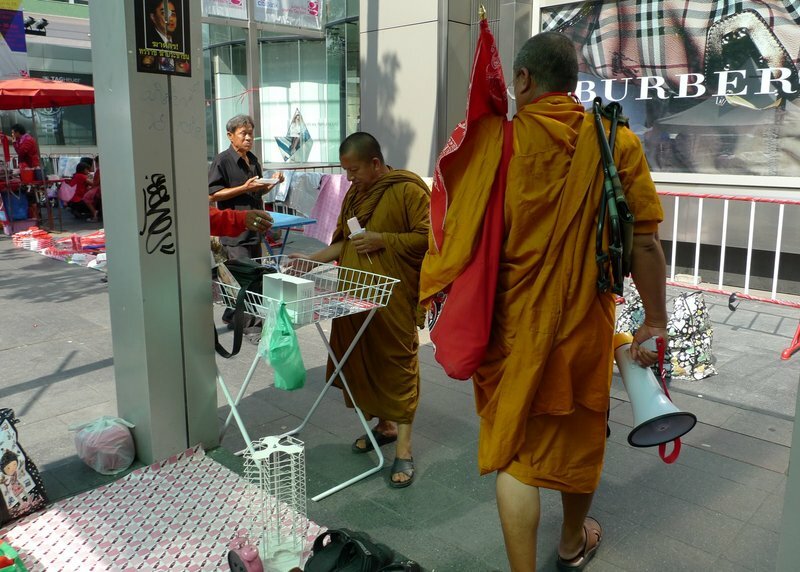 @SufiLover – Some Thais have shared with me how little they respect some people in the monkhood as there seems to be no accountability for behavior. Whether it be political activity or sexual scandal, there are no shortage of examples of less than holy behavior by these holy men. @ElusiveWords – It is a challenge to put together an accurate picture here, too, as there are many aspects to it that are unspoken and there are many factions within the military and other institutions. No doubt most of the lower ranking military members are poor men from the countryside and they have some (if not a lot of) sympathy for the Red Shirts. when it comes to public protests, most definitely the funding comes from the higher up people of the party. meaning, they too are possibly part of the government group, together with giant companies who are in favor of the party’s politics and believes. this is usually the case, with the hope that the party will win the seat and votes and lead the country. when this happens, the giant companies would know the party would create regulations and conduct its governing practices that would be in favor of the line of business/industry those giant companies are in. it’s safe to assume that this happens in every country known to man. that’s just how politics have always been and most probably to continue to exist for years to come. @rudyhou – Very true. People are putting their money based on the outcome they would like to see. And like US politics, I wouldn’t be surprised if some companies and powerful people are putting their money into both camps!